Oakland closed this Lake Merritt homeless encampment recently. Camps assembled out of pre-fabricated "Tuff Sheds" have become one of the city of Oakland's primary responses to the homelessness crisis. Two weeks ago, Oakland set up its third Tuff Shed camp at the southern end of Lake Merritt where as many as 40 people at a time can be served. But while Mayor Libby Schaaf's program has drawn praise, activists have criticized the city for closing other homeless camps — those that aren't controlled and sanctioned by the city — and for enforcing "no encampment zones" where unsheltered people are ordered to leave under the threat of citation and arrest. Other East Bay cities are also pressing ahead with policies designed to remove homeless people from public spaces. For example, one group of unsheltered Berkeley protesters who call themselves "First They Came for the Homeless" have been repeatedly evicted from multiple campsites. In response, they've filed a lawsuit against the city. The city of Berkeley also evicted a community of homeless people living in RVs at the Berkeley Marina in July under threat of having their vehicles towed. But now, a recent federal appeals court decision calls into question whether Oakland, Berkeley, and other East Bay cities are violating homeless people's constitutional rights. In Martin v. Boise, the 9th U.S. Circuit Court of Appeals ruled that local ordinances banning camping are unconstitutional when a city doesn't otherwise provide adequate shelter to house its homeless population. Judge Marsha Berzon wrote that criminal prosecution of people for sleeping outside on public property is a violation of the 8th Amendment's prohibition against cruel and unusual punishment if the homeless have no alternative. "The broader implications of Martin will resonate throughout the West," said Tristia Bauman, a senior attorney for the National Law Center on Homelessness and Poverty who helped argue the case. "It stands for the principle that conduct that is universal and unavoidable, occurring in public, cannot be punished if it is involuntary." Elisa Della Piana, an attorney with the Lawyers Committee for Civil Rights, said the underlying principle is that enforcing laws against basic human needs like sleeping, laying down, and camping are never solutions to the problem of homelessness. "We need to start testing how broad the ruling is and how we can apply its principles in the Bay Area," she said. Alameda County's shelter system has been overwhelmed for years. An official count of homeless people in 2017 found 3,863 unsheltered people on any given night across the county, mostly in Oakland and Berkeley. But there were only 1,618 emergency shelter beds. Oakland, Berkeley, Richmond, Hayward, Alameda, and Albany all have laws against unpermitted camping, according to a 2016 report by the Policy Advocacy Clinic at UC Berkeley's School of Law. There are more than 270 laws against sleeping, lodging, and camping in the state. The recent federal appellate court ruling has already caught the attention of East Bay officials. "Our city attorney is reviewing our enforcement practices and the availability of shelter beds for people without homes and will be providing advice to Hayward police and other city agencies in light of the ruling," said Chuck Finnie, a spokesperson for the city of Hayward. When asked how the Martin case will affect their enforcement procedures, city attorneys and police departments in Oakland, Alameda, Richmond, and Albany did not respond to requests for comment. Two weeks ago, Berkeley Mayor Jesse Arreguin withdrew a proposal to step up enforcement of a state law banning "unpermitted lodging," along with two proposed city laws prohibiting people and their belongings from obstructing sidewalks, around the new downtown BART station and plaza. Arreguin withdrew the proposals on the advice of the city attorney. "While [Martin v. Boise] does allow local governments to impose reasonable time and place restrictions," Arreguin wrote in an email to the Express, "it is important to consider this proposal in light of the new decision." Laura Lane, and assistant city attorney for Oakland, said at a city council meeting last week that while the ruling in Martin v. Boise is "very narrow," the city attorney could provide a memo on its possible applicability to Oakland's policies. 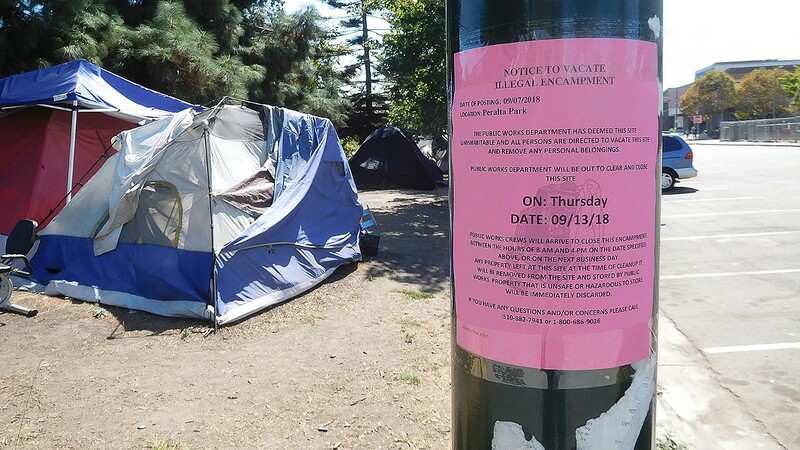 City staffers described the plan to evict homeless residents from around Lake Merritt as a process that begins by classifying lakeside parks an "invitation zone" in which homeless people are invited into the Tuff Shed camp. Later, anyone who does not accept an invitation will be forced to leave their camps as the area transitions into a "no encampment zone." Steven DiCaprio, interim executive director of the Meiklejohn Civil Liberties Institute, said he thinks that in light of the Martin decision, Oakland's Tuff Shed program and simultaneous camping ban are unconstitutional. "People are being forced under the threat of arrest to strike their camp and go to the Tuff Shed camp," he said. Bedford told the Oakland City Council last week that no one is forced to go into the Tuff Sheds, but DiCaprio said it's not voluntary if the city is ordering people to vacate their existing camps. He said the city's long-term plans, which include building multiple Tuff Shed camps, necessarily means that the camping bans will expand across Oakland. "Homeless people are just being worn down," he said. Kaplan expressed similar concerns. "People being told they're going to be kicked out of where they are is not actually 'voluntary,'" she told city staffers last week. "That's not what the word actually means." Legal experts said Martin v. Boise is part of an "emerging body of law" that is strengthening constitutional rights for the poor. The case was preceded by several other important court decisions, the earliest of which was the 1992 lawsuit filed by Michael Pottinger and several other homeless people against the city of Miami. In Pottinger v. Miami, the city's routine citation and arrest of homeless people for camping was challenged in a specific part of the downtown. In one incident that happened while the case was being litigated, Miami police officers actually handcuffed several homeless people, dumped their belongings into a pile, and lit the pile on fire, burning medicines and a bible, according to federal Judge Clyde Atkins, who decided the case. Atkins ruled that Miami's police did, in fact, have a practice of "driving" homeless people from public spaces and punishing them for harmless and involuntary conduct like sleeping and sitting. Atkins concluded that this was a violation of the 8th Amendment. The Pottinger case wasn't binding on California cities, however. In 2006, homeless people and civil rights attorneys sued Los Angeles and succeeded in overturning the enforcement of a city law against sleeping on streets and sidewalks. The circuit court judges in Jones v. Los Angeles cited Pottinger when they found that Los Angeles' camping ban, in absence of adequate shelter beds for the city's homeless population, was unconstitutional. But Jones never actually set a precedent in the 9th circuit region, which includes all of California and eight other states. That's because Los Angeles' attorneys backed off and agreed to a settlement with the plaintiffs that required the city to build 1,250 units of supportive housing. Homeless people and their attorneys accepted the new housing instead of pressing ahead with the case. "It left all the homeless people in the 9th circuit in limbo — until now," said DiCaprio. Michael Zint, a homeless activist in Berkeley, said that the Martin case affirms what his group, First They Came for the Homeless, has been trying to accomplish. "Our position has always been if there's not beds available, you can't punish the homeless," he said. "You have to let them take care of themselves." Civil rights attorney Dan Siegel who represents the First They Came for the Homeless activists said his legal team is strategizing around the Martin case to advance unsheltered people's rights. He added that it's possible a new case could be initiated against the city of Oakland if it tries to enforce camping bans. The end goal, said Siegel, is to convince government that it should address the housing needs of everyone and not abandon hundreds of thousands to live on the streets due to poverty. "Ultimately, we're trying to get to the situation where the refusal to provide shelter to the homeless is itself viewed as an 8th Amendment violation," Siegel said. "The hope is that cities will put enough pressure on the state and federal government to develop the resources necessary to deal with this issue." Correction: the original version of this story misstated the name of the National Law Center on Homelessness and Poverty as well as attorney Tristia Bauman's name.